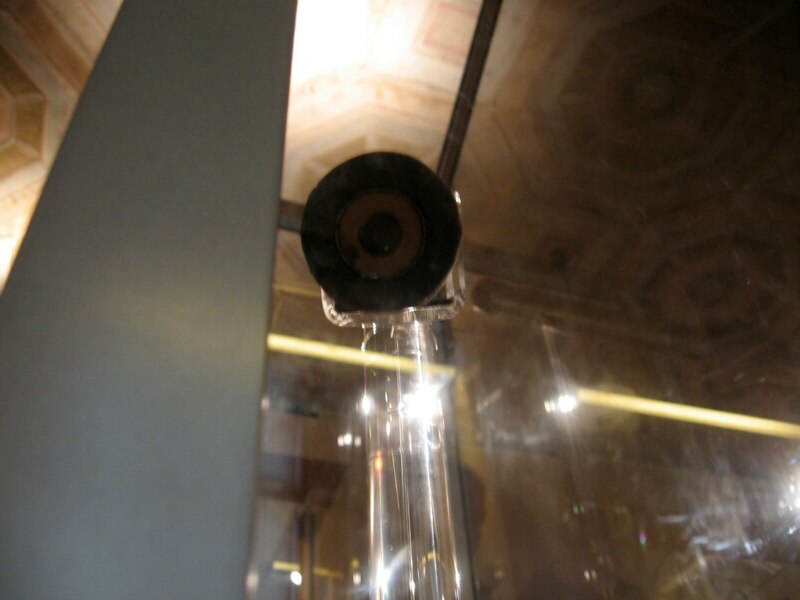 Galileo’s lone surviving in-tact telescope paid a visit to the Franklin institute this year. The telescope is there until September 7, when it will return to Italy. Until then it is part of an exhibit on Galileo and the Age of the Medici. Unfortunately, it is also summer camp time at the Franklin, so, outside of the Galileo exhibit, chaos rules. The museum was overfilled, understaffed, and rather disorganized. I believe it is a minor miracle there was only one accident in the cafeteria while we were there. However, we went there to see the Galileo exhibit, so anything else was kind of a bonus. So, on to the exhibit. First off, if you go, be aware that there is no seating in the exhibit. Well, ok, there is actually one bench. I suppose they don’t really expect people to read everything like I do, so that’s probably enough for all the people that just pass through. There are a huge number of artifacts. I’m not actually sure how many, but I thought there were a lot. And of all different kinds. There were drawing compasses, compasses for measuring height by triangulation, levels, cross-staffs, sundials of every sort, nocturnals, astrolabes, sextants, quadrants, books, diagrams, glassware, lab instruments, drawing tools, and probably a dozen other things I’ve forgotten by now. I was a little disappointed that there wasn’t more explanation about how to use some of the items. For example, the information on the plaques told us that nocturnals were used to tell time like a sundial, but at night, and that it was important to align them with north (and this was on pretty much every nocturnal plaque.) However, it didn’t actually have any instructions on how to read one, and it really isn’t that hard: align the pointer with the pointer stars in the big dipper and read the sidereal time. If there is a dial for the date, set that first and the time you read will be the mean solar time. Still, seeing all the different types of objects, or all the different versions of some objects (there were sundials I would never have recognized as sundials) was really interesting. Outside the exhibit was a hands-on area. It was full of demos about optics, telescopes, and where astronomy stood 400 years ago. If my feet hadn’t hurt so much, that area would’ve been great! The big thing of course was Galileo’s telescope. I’ll leave that for another post though.